For me, finding useful everyday items made in the UK gives me a real buzz. So imagine my excitement at finding a British made mop! Addis Housewares are a British company with a long history. Founded in 1780, originally making bone toothbrushes, they moved into the manufacture of general housewares in the early 1800’s. William Addis, the company founder, could be credited with inventing the modern toothbrush. William was jailed for inciting a riot in 1770 (for reasons I cannot ascertain) and while at His-Majesty’s pleasure fashioned a bristle/bone concoction to buff his pearly-whites. He sounds like quite a character. Eventually his company launched the Wisdom toothbrush brand in the 1940’s, becoming the Britain first mass-produced nylon toothbrush. Sadly, Wisdom toothbrushes are no longer made in the UK. The factory producing them in Haverhill, Suffolk closed in 2009. However, Addis do still make a large number of items in the UK, including my new Superdry mop. Largely moulded plastic and costing just £12 it is surprising that the Superdry mop is made in the UK. This kind of cheap mundane item is all too often imported. If I was going to review it I would say that it is made well-enough and does exactly what it should. What more can I say…. our floors have never been cleaner. It should be noted that not all of the products Addis produce are made in the UK though. They also have large factories in Europe and the Far East, so it is worth checking the labelling before buying. Our mop was clearly marked as made in the UK. I will make contact with Addis and see if they can provide a comprehensive list of which products in their range are made in Britain and keep you updated. wisdom ones for many many years thinking they were made in the county i live suffolk. Thanks for letting us know the factory at Haverhill closed in 2009. Yes, The only toothbrushes made in the UK are made by Kent Brushes (The Handmade Classic, KB42 and Smokers only). I am afraid that is it! 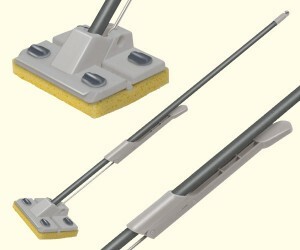 A British-made mop. Who knew? Kevin Foster makes a sound point. Who knew? Why don’t companies who make things in Britain promote this with huge Made in Britain signs? You would certainly think they would want to promote the fact far better!